Instead of showing her gifted talent as a DJ the Chicago native performs her innovative cinematic A/V live set, which meshes music and audio-visual HD video animations. Soundwise the classically-trained musician, versatile dance floor producer, and experimental soundtrack composer takes all steppers on a journey that oscillates sensitive between House and Techno. 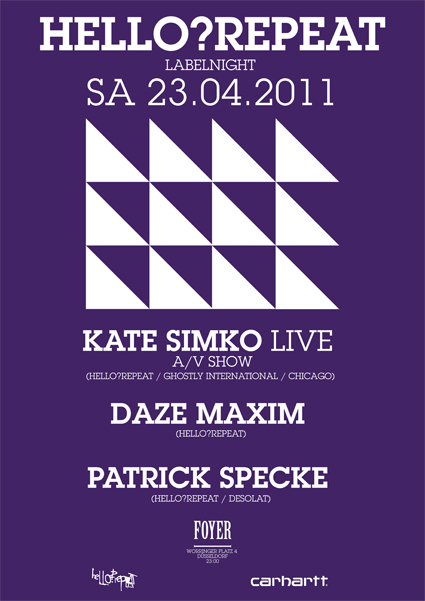 Before and after her live show the notorious Hello?Repeat co-founder Daze Maxim and his buddy Patrick Specke, two passionate border crossers of contemporary dance music, will broadcast their exciting version of freestyle four-to-the-floor seduction.